The online version of this article (doi: 10.1007/s10113-014-0660-6) contains supplementary material, which is available to authorized users. 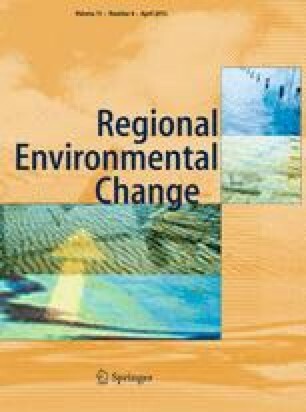 The authors would like to acknowledge the India Meteorological Department, the Intergovernmental Panel on Climate Change, the National Center for Atmospheric Research (NCAR) and the Ministry of Home Affairs (Government of India) for making the climate model and socioeconomic data available. The authors would also like to acknowledge Louise Krol from Monash University for her help in editing the manuscript.